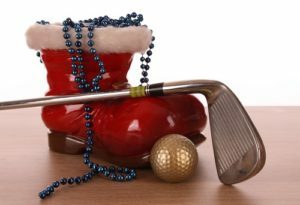 Why Golf Is A Great Hobby For Retirees? A lot of retired people find joy in playing golf. The sport continues to be a conventional past time for retirees in the United States. For a lot of people, the idea of warm and green weather conditions motivates them to work through the last years of a fulfilling and hard-worked career. Golf courses in different parts of the world accommodate retired people who love to play this sport. One great benefit of golf is that it offers retired couples a recreational sport that they can enjoy together. As a matter of fact, in most cases, one partner in a marriage learns the game after retirement so he or she can spend more time with his or her spouse. 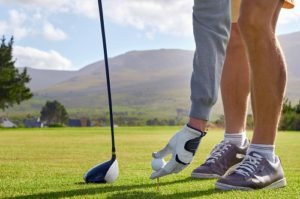 Golf offers these couples a great opportunity to spend time with one another, enjoy a good game of golf together, and even play in golf outings and golf tournaments. Another wonderful advantage of having golf as a preferred hobby during retirement is that it provides people the opportunity to combine travel, which a lot of retirees also enjoy, with their strong interest to play golf. 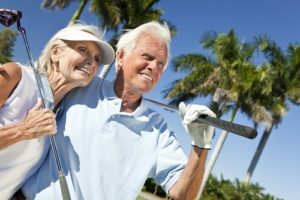 A lot of golf vacation spots in the United States like Palm Springs, Myrtle Beach and other locations in Maine, Arizona, Florida, and other states, have condos and resorts that cater to retired people. These are places where they can have a memorable tropical vacation while enjoying the sport. 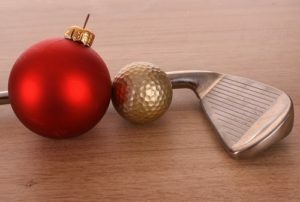 Retirement and golf also offer the chance to achieve several goals in just a single enjoyable activity. A lot of retirees enjoy walking to keep themselves fit and healthy. Golf offers a lot of health benefits to retirees. Maybe 9 or even 18 holes of golf can provide 1 to 4 miles of moderate walking, provided that the golfers do not use a cart. It is a great activity for couples and they can even make friends by playing with other retired couples. Furthermore, this sport uses several upper back and arm muscles, which improves their flexibility. One of the greatest perks of playing golf during retirement is the ability to play at golf courses during low traffic times. While working people compete for tee times to play during the weekends or in late afternoons, retirees can play on less busy times and even on weekday mornings. This makes their play time more efficient and lets them enjoy longer games. The National Golf Foundation said that about 49% of golf players in the United States who play at least 25 rounds per year are at least 50 years old. A bit more than half of this group is actually at least 65 years old. This shows how strong a market retirees are to golf courses and the golf industry in general. 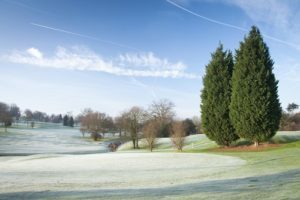 Because of their significance in today’s market, there are several golf courses spread across the country that provide courses as well as amenities to specifically focus on the needs of this group. 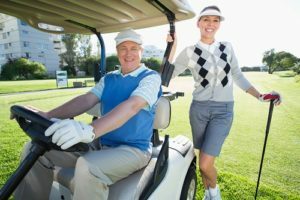 Because of that, golf resorts and golf courses are serving retired people in such a way that helps encourage all of the benefits that were discussed previously. It is a fact that golf is not cheap. Senior citizens are by far the heaviest spending group, among the many different demographic segments that are playing golf. Although most golfers are in their 30s, retirees play more often because they have more free time. That’s why almost half of those who play at least 25 times every year are retired people. Apart from playing more often, retired people spend a lot on accessories like apparel, bags, clubs, gloves, and services like using golf carts and more. As mentioned earlier, golf can be quite expensive. However, retirees can save a lot of cash if they go for golf packages. 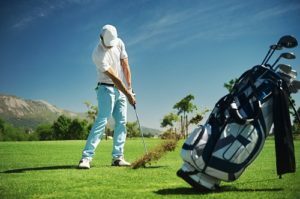 Myrtle Beach Golf Directors offers a range of Myrtle Beach golf packages and finding one that suits your needs will surely be easy. Call Myrtle Beach Golf Directors now if you want to know more about golf packages.